Ideal for color theory and design classes, these highly pigmented opaque watercolor paints have excellent mixing and blending properties for intensity and value of color. The vibrant colors dry to a rich, matte finish and clean up easily with soap and water. 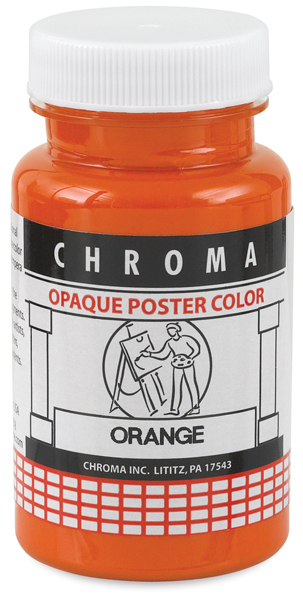 Chroma Opaque Poster Colors come in sets that are ideal for artists, designers, sign painters, teachers, and art students. Opaque Poster Colors, Set of 12 — This set includes 12, 3.5 oz jars, including one each of Black, Blue, Green, Red, White, Yellow, Brown, Green Light, Orange, Ultra Blue, Purple, and Yellow Oxide. Opaque Poster Colors, Set of 6 — This set includes six 3.5 oz jars, including one each of Black, Blue, Green, Red, White, and Yellow.